Florida Child Support Guidelines: Your livelihood is at stake, to the extent that you educate yourself on Florida's child support guidelines. Perhaps your spouse says you are overreacting to legal proceedings for child support. In this one case, your spouse is absolutely wrong. At least until your youngest child reaches the age of 18, you will be the one affected by child support payments. You are the one solely responsible, if you are not able to pay the required amount. Getting serious about Florida child support laws is the smartest decision you can make for yourself. According to Florida child support guidelines, noncustodial parents can have up to 65% of their paycheck taken out for child support even with another family to support. Now is the time to protect yourself by understanding what is involved in Florida child support guidelines. First, know that child support payments can always be changed. While it may be a tedious legal process, it is worth it. Perhaps you were an investment banker and you just got laid off. In Florida, through the Motion for Modification process, you can try to change the amount of your child support payment. If your child has turned 18 or you believe there is reason to stop child support payments by following Florida child support guidelines, contact the Clerk's Office at the court house where the court order for paying child support was filed. Be skeptical about your Court orders. Order a copy of your final judgment from the clerks office and reread them. You may be entitled to have the payments terminated. You can then go through the Motion for Modification process, and the Court will determine if payments can stop being made to the child or children. In the dire situation that you are not able to make the child support payments, understand that this can become another lengthy legal process. You never want to be in this situation. If you are in this situation, know that child support and child visitation are two separate legal matters. According to Florida child support guidelines, you are still allowed to legally visit with your children, even if you can't pay the child support. The bottom line is, noncustodial parents can really get taken advantage of during the child support process. They need to be on their guard, and understand every single one of their rights. As a responsible parent, it pays to know your child support rights in Florida. 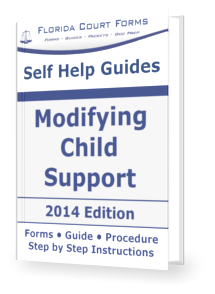 The Self Help Guides' Modifying Child Support in Florida helps you navigate the court process and procedures once you file your documents with easy to follow checklists, links to websites, important addresses & phone numbers, and much more. The Self Help Guide includes easy to follow step by step instructions, all the required & supporting forms, filing procedures & checklists, complete guide to the Financial Affidavits, easy to understand and written in plain English. Order the e-book instant download or use our Petition Preparer professional documents preparation service. Your documents will be in your hands and ready to file at the courthouse in 3 days or less! We guarantee our work.